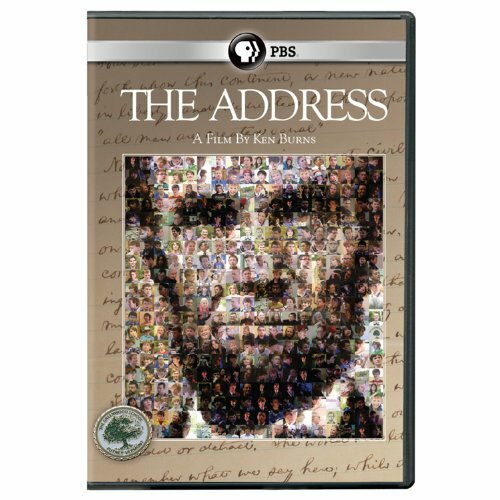 Arlington, Va. - March 13, 2014 - PBS Distribution today announced it is releasing The Address on DVD. The Address a new film from award-winning filmmaker Ken Burns, tells the story of a tiny school in Putney, Vermont, the Greenwood School, where each year the students are encouraged to memorize, practice and recite the Gettysburg Address. In its exploration of the Greenwood School, the film also unlocks the history, context and importance of President Lincoln's most powerful address. The Greenwood School students, boys ages 11-17, all face a range of complex learning differences that make their personal, academic and social progress challenging. "THE ADDRESS" reveals how President Lincoln's historic words motivate and engage these students a century-and-a-half after Lincoln delivered a speech that would go on to embolden the Union cause with some of the most stirring words ever spoken. "In his address, President Lincoln said, 'The world will little note, nor long remember what we say here,' and yet 150 years later, the students of the Greenwood School are using his momentous words to overcome adversity," Burns said. "We want to tell this story to inspire everyone across the nation, especially school children, to learn the rich history of American freedom and sacrifice embedded in one of the most important declarations ever made." The Address will be available on DVD April 22, 2014. The run time of the film is approximately 90 minutes. The DVD SRP is $24.99. The program will also be available for digital download. Inspired by the subject of The Address , in November 2013, on the occasion of the 150th anniversary of the Gettysburg Address, Burns and PBS launched LearnTheAddress.org, an initiative that invites people to upload videos of themselves reciting the Gettysburg Address to the project's web site. To date, the site has accepted thousands of submissions from people across the country. The campaign uses social media and videos from public figures, political leaders, entertainers and Lincoln historians reading the Gettysburg Address to encourage people to submit their own videos. Among those submitting videos are Barack Obama, Marco Rubio, Nancy Pelosi, Warren Buffet, Carol Burnett, Stephen Colbert, Bill Gates, Whoopi Goldberg, Rita Moreno, Conan O'Brien, Robin Roberts, Jerry Seinfeld, Martha Stewart, and many others. The initiative is running through April 15, 2014, when The Address will air on PBS (check local listings). In addition, WETA, the Washington, DC, public television station that is Burns's production partner, has developed a standards-based education curriculum designed to help students understand why the Gettysburg Address is regarded as one of the finest political speeches of all time, along with tips and strategies for memorization. The lesson plans and activities will be available to all schools around the country through the film's companion web site: pbs.org/theaddress. Educators can also access these resources through PBS Learning Media. The Address is a production of Florentine Films and WETA Washington, DC, and is directed by Ken Burns. Funding for "THE ADDRESS" is provided by Bank of America; the Anne Ray Charitable Trust; Public Broadcasting Service; and members of The Better Angels Society, including The Pfeil Foundation and Robert & Beverly Grappone. Funding was also provided by Corporation for Public Broadcasting (CPB), as part of "American Graduate: Let's Make It Happen," a public media initiative to help communities solve the national high school dropout crisis and keep more students on a successful path to college and career. WETA Washington, DC, is the third-largest producing station for public television and the flagship public broadcaster in the nation's capital. WETA productions and co-productions include PBS NewsHour, Washington Week With Gwen Ifill, In Performance at the White House, The Kennedy Center Mark Twain Prize and documentaries by filmmaker Ken Burns, as well as historical specials such as the recent six-part Latino Americans. Sharon Percy Rockefeller is president and CEO of WETA. More information on WETA and its programs and services is available at weta.org. PBS, with its over 350 member stations, offers all Americans the opportunity to explore new ideas and new worlds through television and online content. Each month, PBS reaches nearly 120 million people through television and over 29 million people online, inviting them to experience the worlds of science, history, nature and public affairs; to hear diverse viewpoints; and to take front row seats to world-class drama and performances. PBS' broad array of programs has been consistently honored by the industry's most coveted award competitions. Teachers of children from pre-K through 12th grade turn to PBS for digital content and services that help bring classroom lessons to life. PBS' premier children's TV programming and its website, pbskids.org, are parents' and teachers' most trusted partners in inspiring and nurturing curiosity and love of learning in children. More information about PBS is available at www.pbs.org, one of the leading dot-org websites on the Internet, or by following PBS on Twitter, Facebook or through our apps for mobile devices. Specific program information and updates for press are available at pbs.org/pressroom or by following PBS PressRoom on Twitter. American Graduate: Let's Make it Happen is helping local communities identify and implement solutions to the high school dropout crisis. American Graduate demonstrates public media's commitment to education and its deep roots in every community it serves. Beyond providing programming that educates, informs, and inspires public radio and television stations -- locally owned and operated -- are important resources in helping to address critical issues, such as the dropout rate. In addition to national programming, more than 75 public radio and television stations in 33 states have launched on-the-ground efforts working with community and at risk youth to keep students on-track to high school graduation. More than 1000 partnerships have been formed locally through American Graduate, and CPB is working with Alma and Colin Powell's America's Promise Alliance and Bill & Melinda Gates Foundation. More information is available at www.americangraduate.org.